The 23rd century Communicator designed by Wah Chang is standard issue aboard Starfleet vessels. Using subspace transmissions, the iconic Communicator allows virtually instantaneous communication over distances that would introduce a significant lag using 21st century radio signals which must travel through normal Euclidean three-space. This Communicator is not a toy: it is an advanced, Bluetooth® wireless technology enabled communications device, designed to pair with a mobile phone permitting near instantaneous person-to-person communication at a considerable distance. When paired with a device capable of streaming music, the Communicator may also be used as a wireless music speaker. This Communicator has been developed to give its owner the maximum level of enjoyment, designed using extremely accurate 3D scans of one of the last remaining hero props from the 1960s Original Series television show. Dedicated attention to detail, the use of authentic materials, textures and finishes and the support and extraordinarily deep knowledge of HeroComm.com, so generously given to us, has resulted in a fully-functioning, display-grade product that is highly faithful to the original prop. With its 20 authentic U.S.S. Enterprise NCC-1701 sound effects and crew voice clips, the Communicator provides plenty of opportunity for in-universe interaction and fun, and its Bluetooth wireless technology enables it to be used exactly as it was always intended – as a person-to-person communications device. The Communicator is not a walkie-talkie. In order to use it to talk to another person, you will also need a Bluetooth-enabled mobile phone that can make and receive telephone calls. To assemble the stand, insert the front of the charging cradle into the front slot in the metal base, then tilt the cradle backwards so that the spring latch clicks into place in the rear slot. To disassemble the stand, press the spring at the back of the charging cradle to disengage the latch, tilt the cradle forwards and lift away from the base. The Communicator is powered by a rechargeable lithium polymer battery. Before first use, please charge your Communicator for four hours, or until the charging cradle activity indicator fades gently between green and blue. To charge, first assemble the stand as described above, then insert the micro-USB cable supplied into the back of the charging cradle and connect to a USB power supply (or any powered USB socket) so that the activity indicator pulses white. Note: The Communicator charging cable can be found under the stand in the Communicator’s protective transit case; however, any micro-USB cable may be used. Dock the Communicator handset to the charging cradle, ensuring that the curve of the back of the Communicator fits snugly to the contour of the charging cradle and so that it is positioned centrally on the cradle. When the Communicator is located centrally, the antenna grille will line up with the charging cradle when viewed from the front. When the Communicator is charging, the charging cradle activity indicator will fade between yellow and red. If the Communicator is positioned incorrectly the indicator will flash red; please reposition the Communicator so that the indicator glows yellow and red. When the Communicator is fully charged, the activity indicator will fade between green and blue. The Communicator indicates that it needs charging by saying, “Power cell drained”, and the left jewel glows red. The Communicator may be used while it is docked and charging, although this will increase the time taken to charge the Communicator. The Communicator may be left permanently on charge, as special circuits manage the charging process. Please note that the charging cradle and the back of the handset will get warm during charging and on standby. Note: The Communicator’s battery might be damaged, or its lifetime significantly reduced, if it is left uncharged for long periods. To maintain a healthy battery, please recharge your Communicator at least once every six months. To power up the Communicator, press and hold the left button until the power up sound is heard. When the Communicator is powered up and is not connected with another Bluetooth device, the left jewel flashes green. 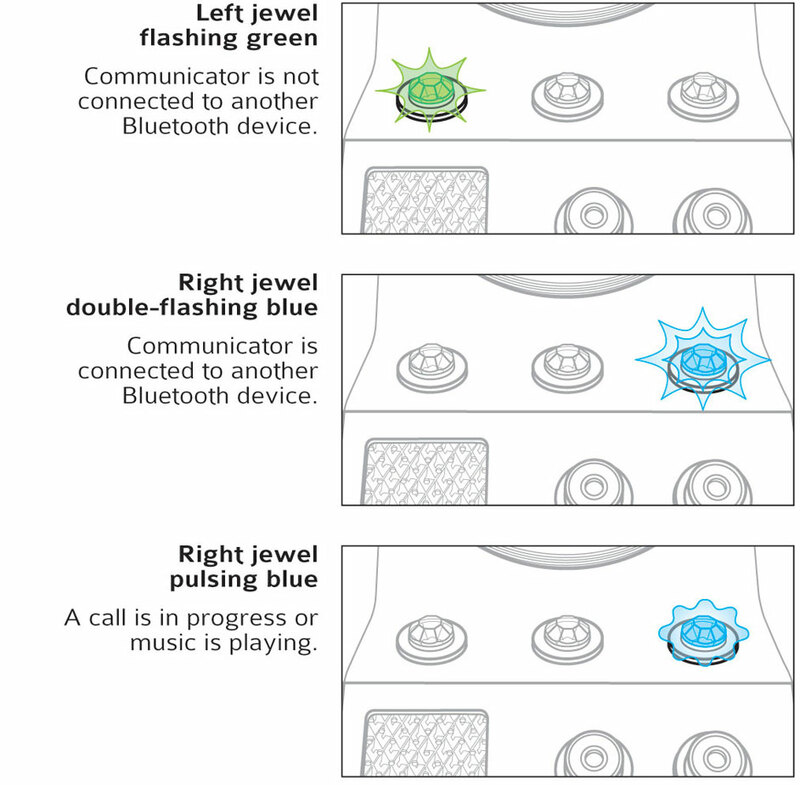 When the Communicator is connected with another Bluetooth device, the right jewel double-flashes blue. When the power cell needs recharging, the left jewel glows red. Press and hold the left button to power down the Communicator. When powering down, the left jewel will glow red briefly and the power-down sound will be heard. The Communicator automatically powers up when it is docked to the charging cradle if the charging cradle is connected to a power supply. The antenna grille has been designed to be able to be flipped open. The grille may also be opened by rolling the hinge wheel with the tip of your forefinger. Do not force the grille past its fully open position. Opening the grille plays the classic Communicator chirp sound. When the Communicator is paired and connected to a mobile phone, opening the grille will answer an incoming call and closing the grille will end the call or reject an incoming call (if the grille was open when the call was coming in). Note: As with the original Communicator props, the grille edge wire rests on the rear corners of the switch plate when the grille is in the closed position. Some wear of the grille wire and the rear corners of the switch plate, where they touch, is to be expected and should be considered a normal part of the authentic user experience. The Communicator has only two buttons. The left button is a simple press button; it is used on its own with single click, double click and press-and-hold actions, and is also used in some cases to extend the function of the right button by being held down while the right button is pressed or jogged. The right button is a five way jog button; it is mostly used on its own and either pressed or jogged up, down, left or right. However, its use may be extended in combination with a left button press-and-hold. The function of each button is determined by what the Communicator and the connected device are doing when they are pressed. The Button Pressing Guide shows what each button or combination of button pressing actions does. The Communicator does not have to be paired with or connected to any devices if you only want to play the built-in sounds and Enterprise crew voice clips. The different sounds and voice clips are accessed by performing various combinations of button presses. Most sounds are triggered solely by the right button. Matching pairs of voice clips of Uhura, Spock, McCoy, Sulu, and Scott are stored on each of the five button actions. The first of each pair of voice clips may be accessed by a single press or a single jog in a given direction and the second voice clip of each pair played by a double press or double jog in the same direction. By speaking in between the paired voice clips, the user will be able to have a “conversation” with one of the main Enterprise crew members as if they were the Captain. For users who do not have a Bluetooth-enabled mobile phone, or do not wish to pair the Communicator with a mobile phone, but still want to be able answer the hailing beep by flipping open the antenna grille, a delayed hailing beep may be initiated by pressing and holding the left button and then immediately jogging and holding the right button to the right for several seconds. When the hailing beep sequence is initiated, a confirmation tone is immediately heard, followed five seconds later by the hailing beep. In order for the Communicator to be used to receive and make telephone calls or play music, the Communicator must be paired with and connected to a Bluetooth enabled mobile phone. Note: Phone capable of Bluetooth voice dialing needed to initiate outgoing calls from the Communicator. IMPORTANT: The exact sequence of pairing your mobile phone with a Bluetooth handset will differ from phone to phone, so please read your phone’s manual to make sure of the procedure, before following the instructions below. • Activate Bluetooth on your mobile phone. 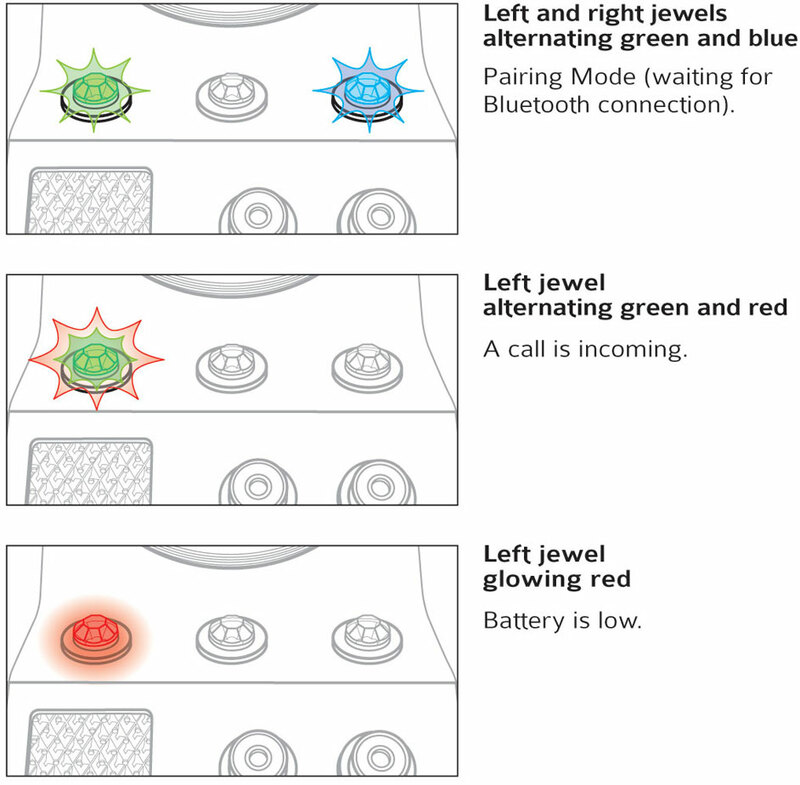 • Press and hold the right Communicator button until the Communicator says, “Waiting for Bluetooth connection” , and both the left and right jewels alternately flash green and blue. • Make sure your mobile phone is searching for devices. • Within 60 Seconds, your mobile phone should show TWC Communicator in its list of available devices. • Select TWC Communicator from the list. • Your mobile phone should report that it is pairing. • Once the Communicator is paired it will emit a short high-pitched tone and say, “Connected”. • The right jewel will double flash blue while the Communicator is connected. Typically the Communicator’s Bluetooth radio will work with a range of up to five metres. Atmospheric conditions and dense solid objects (such as walls) can reduce this range. If the Communicator moves out of range of the device it is paired with, then the connection will be broken. However, the Communicator and the other device will not forget their pairing and as soon as they move back within range of each other they will automatically reconnect. Once the Communicator is paired with a device, it will remember that device and the device will remember the Communicator. Each time it is powered on and that device is within range, it should automatically reconnect to the paired device and say, “Connected”. If a paired device does not automatically reconnect, then single-click the left-hand button on the Communicator to reconnect. To unpair the Communicator from a phone that it has been paired with, browse to the phone’s Bluetooth settings menu, select TWC Communicator from the paired devices list and select “unpair” or “forget”. Note: The exact sequence for unpairing will vary, so please consult your mobile phone manual for the correct procedure. Whilst paired, the volume of the Communicator’s speaker may be adjusted by holding the right button up or down. A low beep is played for each volume step and a higher beep is heard when the volume is at its maximum or minimum setting. Depending on the paired device, adjusting the ringtone or music playback volume on the phone may affect the volume of the phone sounds heard through the Communicator. Once the Communicator has been paired with and is connected to a mobile phone, it can receive calls made from other phones to that mobile phone. When a call is coming in, the Communicator will play the hailing beep until the call is answered. If the Communicator’s antenna grille is closed, flipping it open will play the classic chirp and answer the call. 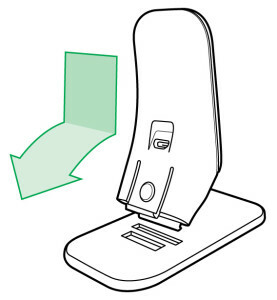 If the antenna grille is already open (if the Communicator is on the charging stand, for example) then the call may be answered by a short press of the right button. If the antenna grille is already open the incoming call may be rejected by a long press of the right button or by closing the antenna grille. The Communicator is not intended to be held to the ear while making a call and therefore cannot be used to make private telephone conversations. It is designed to be used as it was by the Enterprise crew, when it was typically held around 150 mm (6”) from the mouth and spoken to as if speaking to a person standing nearby. If privacy is required, a call that has been answered on the Communicator may be transferred to the mobile phone by pressing and holding the right button during the call. To end a call, close the antenna grille or single click the right button. The Communicator does not have a numeric keypad or graphical display, so calls may only be initiated via the Communicator if it is paired with and connected to a mobile phone that supports voice dialing from a hands-free Bluetooth handset, or by using the ‘last number redial’ function (see below). To make a call, single click the right button to initiate voice dialing. Once voice dialing is initiated the Communicator will play speech prompts and confirmation tones from your mobile through the Communicator’s speaker and your mobile phone will use the Communicator’s microphone. For some phones, an internet connection is required for voice dialing. IMPORTANT: Please check your mobile phone’s user manual to find out if your mobile phone supports voice dialing from a Bluetooth headset, and best way to activate and use it. There are some mobile phones that can only use voice dialing if a key is pressed on the mobile phone to initiate voice dialing. You will not be able to use a phone like this for voice dialing from the Communicator. Also, identical mobile phones may handle remote voice dialing differently depending on what version of operating system software they currently have installed. Press and hold the right button for last number redial. This can be useful where your mobile phone doesn’t support remote voice dialing, but you would still like to make a call from your Communicator. 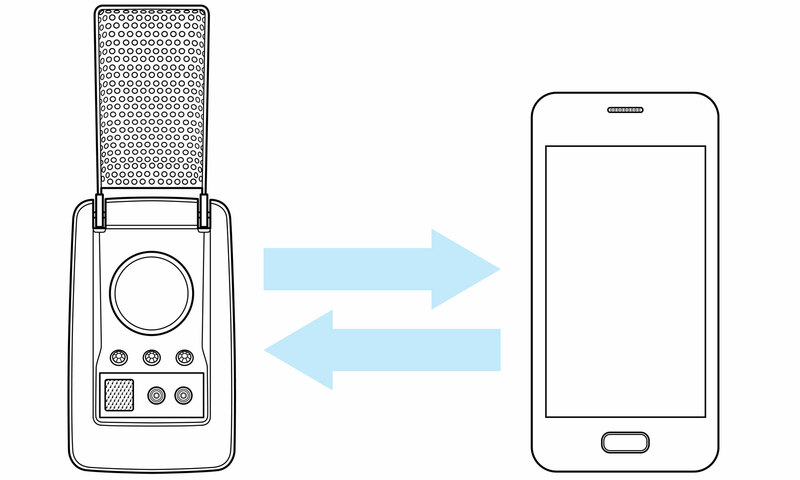 When the Communicator is paired with and connected to a device capable of streaming music it can act as a wireless Bluetooth speaker. Remember that the Communicator speaker is relatively small and therefore the music will not be as loud or as rich as that played through a dedicated Bluetooth speaker designed purely for playing music. To play music, double click the right button. If music doesn’t start playing automatically, browse to the music on your music player and select play. Once the music is playing through the Communicator, double clicking the right button will pause or play the music. While playing music, the right button’s functions are altered slightly. Instead of voice clips, jog right and jog left will skip tracks forward and back respectively. Hold right and hold left are fast forward and rewind. The Communicator is a high tech communications device and should be handled with care. Clean only with a soft, slightly damp cloth; do not immerse in water; do not force the antenna grille past its maximum opening point. Do not press on the spinning moiré display as this can damage the spinner and motor. To protect the Communicator while not on display, keep it safely in its shock-absorbent transit case. To protect the Communicator’s surface finish, always carry it in its soft leatherette pouch. The Communicator should only be used when its operating temperature is between 10˚C and 40˚C (50˚F to 100˚F). IMPORTANT: Do not use your Communicator where it is dangerous, prohibited or inconsiderate to do so. This device complies with Part 15 and Part 18 of the FCC rules and with RSS-247 and RSS-216 of Industry Canada. Operation is subject to the following two conditions: (1) This device may not cause harmful interference, and (2) This device must accept any interference received, including interference that may cause undesired operation. Users are not permitted to make changes or modify the device in any way. This equipment has been tested and found to comply with the limits for a Class B digital device, pursuant to Part 15 of the FCC Rules. These limits are designed to provide reasonable protection against harmful interference in a residential installation. • Reorient or relocate the radio or television receiving antenna. • Increase the separation between the computer equipment and receiver. • Connect the equipment to an outlet on a circuit different from that to which the radio or television receiver is connected. •	Consult the dealer or an experienced radio television technician for help. 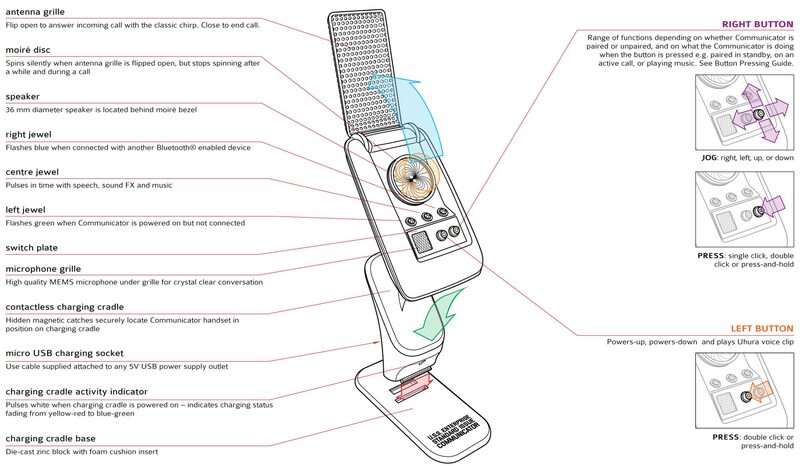 The Wand Company declares under its sole responsibility that the Star Trek Bluetooth Communicator (model number WRC11215) is in conformity with the essential requirements and other relevant requirements of the Radio Equipment Directive (2014/53/EU). The full Declaration of Conformity (DoC) is available here.